I tell you there is nothing better on pancakes (or french toast or waffles or ... you get the idea) than real maple syrup. What's even better? When you helped make that syrup. 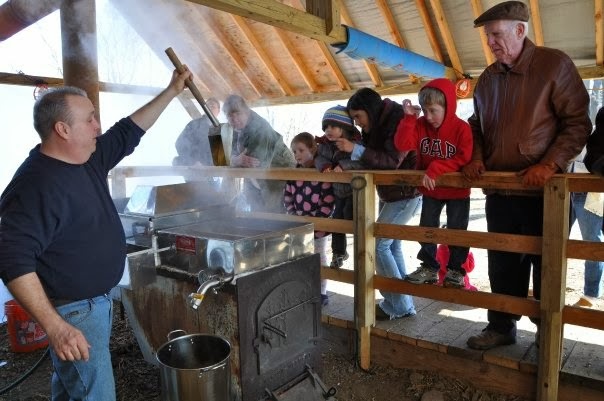 Get in on the fun at the popular Maple Syrup Tap-A-Tree program at Ambler Farm in Wilton, CT. Cost: $60 for member families or $65 for non-member families. Register: Reserve your spot online. Registration is already under way for members. If there's space available, non-members can start signing up as of January 15th. At the program you'll learn the science and history of maple syruping by being a hands-on part of the process. There will be two training sessions offered; only ONE session is required for training. On that day you will choose a tree and hang your bucket that will collect sap. They will send regular updates on the running of the sap so you can come to the Farm to collect sap from your tree. They will boil down the sap in the sugar shack and send each family home with their very own bottle of Ambler Farm maple syrup. The season runs from early February to mid-March. Maple syrup production is winter farming and therefore weather dependent. A typical season is five weeks long. If you are traveling during February or March, they will collect sap for you.